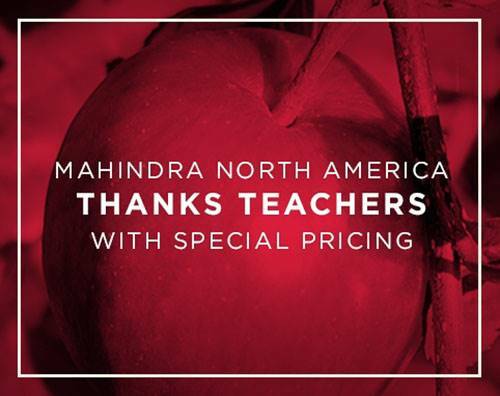 Current and retired educators and administrators receive a $100.00 rebate with the purchase of a new Mahindra Tractor with two qualifying implements, or UTV. This offer is available to all current or retired teachers and administrators at all levels, kindergarten through high school as well as professors in our junior colleges and universities. Thank you for serving and inspiring our youth, families, and communities. Offer in U.S. Dollars. This offer is available to all current or retired teachers and administrators at all levels, kindergarten through high school as well as professors in our junior colleges and universities. This rebate is for new Mahindra tractors ONLY. Vehicles that have been on the loaner program over 30 days are considered used. Please confirm loaner status with your dealer.